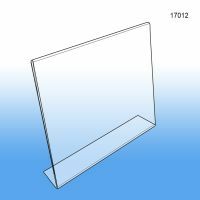 Choose from three popular sizes, 5" x 7", 8.5" x11" and 11" x 8.5"
Clip Strip Corp. carries a wide assortment of literature and countertop sign holders and POP signage hardware. 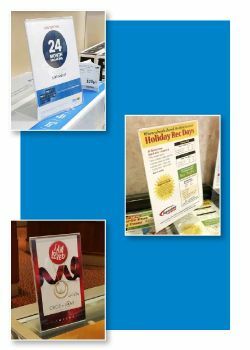 Our slant back acrylic sign holders are used in the hospitality business at the restauant table, in retail stores, inside banks, it runs the full spectrum at service oriented establishments. 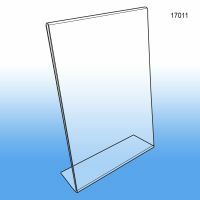 Make sure you communicate to your customer base with countertop product display materials. 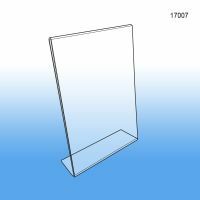 Need PRINTING for what you place in these Sign Holders, ask Clip Strip Corp. to quote on your specifications. We have a full service POP Printing division to help meet your printing needs! Count on us for all your sign holders and product merchandising tools!